Today was not a great day for diving, but the surface entertainment helped make up for it. 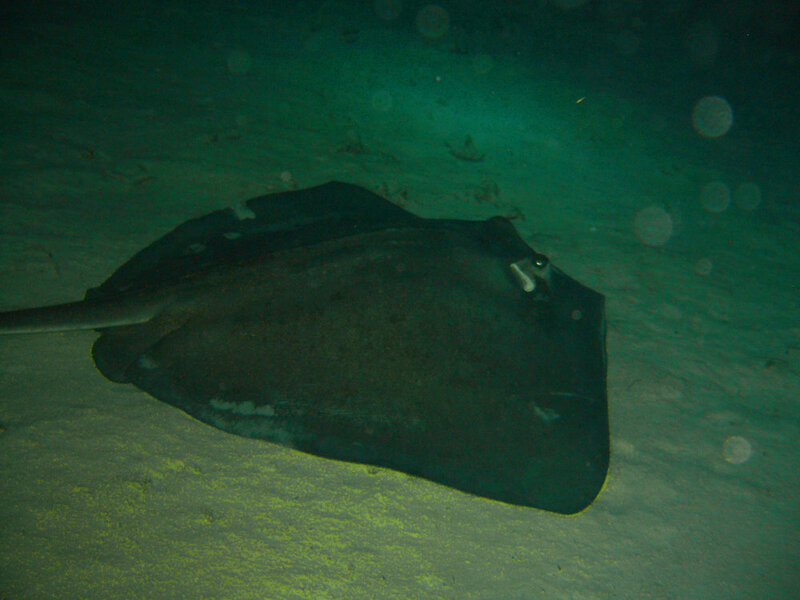 We started on the same reef as the night dive last night. When we got in the water, there were three remoras hanging out under the boat looking for snacks. Several of the newer divers were nervous. If you haven’t seen a remora before, they look similar enough to sharks to get your attention. The main difference is that the remoras look like someone stepped on the top of their head and left a flat boot imprint. That’s what they use to attach to passing sharks, turtles, boats or scuba tanks (if you’re lucky). 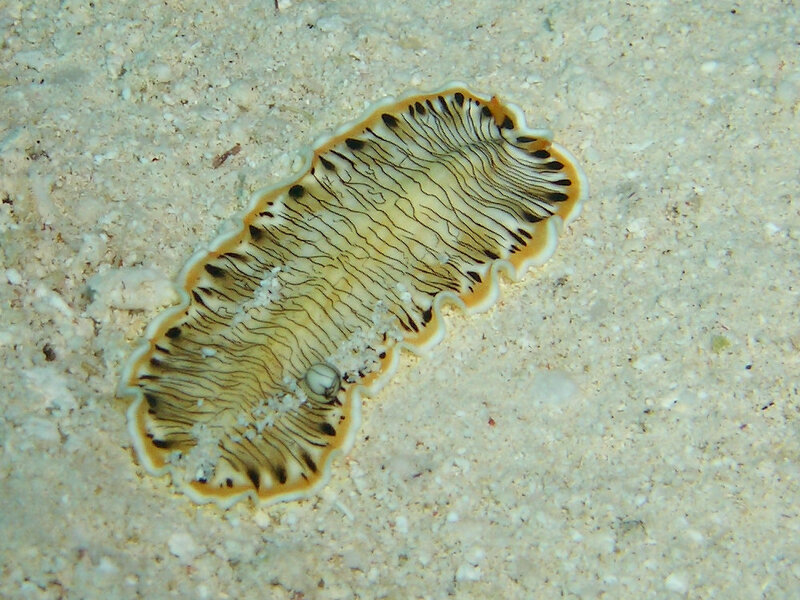 As soon as we got down, we spotted a Lined Flatworm. It was happily cruising across the sand at top speeds of several inches a minute. There were more of the Red-Tipped Sea Goddesses, sting rays and angelfish. Late in the dive, a turtle swam by and let us follow him for a while. He didn’t seem at all concerned about us, but even a slow moving turtle could swim much faster than us if it wanted. Once everyone was back on the boat, we started the crossing to Eleuthera. It was a rough crossing, but no where near as bad as the first one we did. About half way over, a pod of Common Dolphin decided it would be fun to play in our bow wake. They ducked under the bow, popped up for a breath and seemed to elbow each other out of the way for the best spot. I didn’t dare leave the bow to get the camera, fearing they would be gone by the time I got back, but they stayed with us for five minutes. They appeared to be having so much fun. After the crossing, we had two more dives. The first one was at Ike’s Reef where there were several swim-throughs where we could go through an archway in the rock or a small tunnel. There were loads of Flamingos’ Tongues, but not much else. The last site was Knuckle Heads. There was more dead coral there than I’ve seen in a long time. Although there was still some Yellow Headed Jawfish in the sand around the coral heads, one of the most common fish on the reef was the Lion Fish (an invasive species which is quickly spreading). The water was murky and the coral was dead so when I heard that was the site of the night dive, I opted out. This was one of the first dives I have turned downed in my life. Most of the other divers agreed, only two of twenty divers got in the water. I’m hoping tomorrow has better diving. 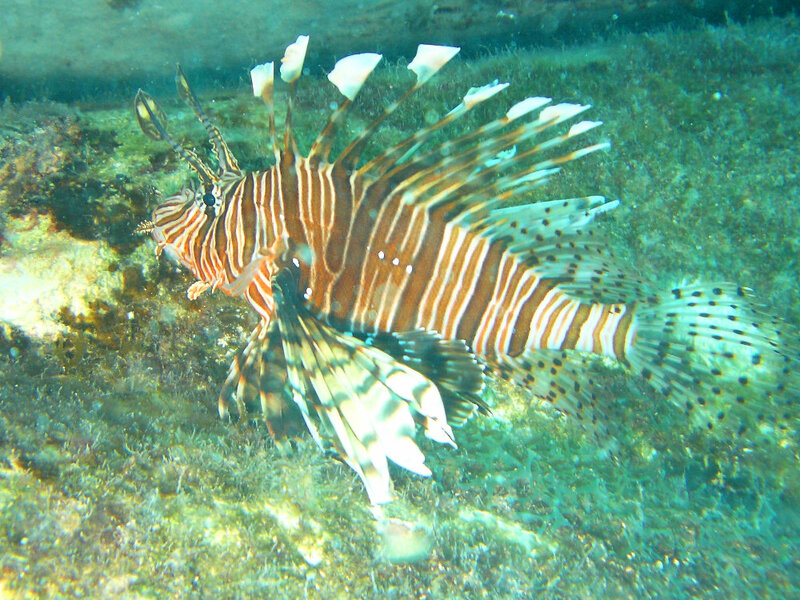 This entry was posted in Travel and tagged Bahamas, diving, dolphins, Eleuthera, scuba. Bookmark the permalink.